8 Good Things A Curated Newsletter | A bit of inspiration in your inbox. I am loving your newsletter and insightful articles on Self-Care and Self-Awareness. You are doing incredible work. ~ Erahm C.
I enjoy a lot your newsletter. It is one of the few newsletter I normally end up clicking on something. I often show it as well-made newsletter. ~ Jorge P.
Gratitude to Maria Baltazzi for sharing this article [Live Like a Stoic] in her weekly 8 Good Things email. Especially worth signing up for in today's trying times. ~ Morgan R.
I particularly found the content of [21 Weird Ways the World Changes in Autumn] very interesting, practical and useful. 3 [Live Like a Stoic], 4 [Fall Asleep Instantly with This Breathing Technique], and 5 [Try Any of These 33 Habits of Happy and Successful People] were particularly applicable for my worldview and circumstances. Great read. You touched upon some good topics. Thanks. ~ Matt R.
Nice hearing about all your adventures. I love what you are doing. Thanks, Maria! I love Brene Brown. Thanks for the suggesting the meditation app. I loaded it on my phone and will try it this weekend. ~ Amy C.
Hi, Maria. Or should I say hi DOCTOR! Big, big congrats! Always love seeing 8 Good Things and what awesome news along with this latest set. ~ Eric R.
Congratulations, Maria, on your doctorate. Enjoyed your letter and love the 20-secs to courage. ~ Loyelle E.
Great newsletter this week. Fabien’s book looks good. ~ Ethan Z. Love you. Such great info you share. Xo ~ Brenda L.
My favorite newsletter yet!! Thank you ;-) ~ Allison C.
I enjoy your newsletter. ~ Mary T.
I loved the articles and especially the ones you did for “LightWorkers.” ~ Mark M.
Great article on Thought Trains, Maria! I teach Bible study class to a group of high school kids each Wednesday morning. I’m going to use this! ~ Nathan D.
I always enjoy and learn from your emails, thx. ~ Noelle F.
Maria…I LOVE your newsletter. Your faithful reader. ~ Gary F.
I enjoy your newsletters and end ended up watching both “Before the Flood” and “The Way” as a result of your newsletters. Thanks so much for the recommendations and sharing these meaningful flicks! I look forward to reading more of your musing and inspirations. ~ Diane C.
Thank you, Maria! The sleep info very timely ;-) ~ Sylvia V.
Dear Maria, thank you for all you do, it is wonderful. ~ Dean A. Thank you for sharing your wonderful experience. ~ Mike P.
Hey Maria! Just wanted to let you know how much I enjoy your Friday emails. Lots of great positive energy to the end the week. Hi, Maria. This is just great reading, thank you very much. ~ David M.
My husband just forwarded me your email/newsletter. Wow!!! Very impressive. ~ Milica G.
Amazing, amazing. I just love getting these email newsletters. Good one MB. Love ur work. ~ Kirk W.
Cool! Thx Maria ~ Bob M.
I love these. Thank you for doing them. ~ Carla J. Really enjoyed this, Maria!! ~ Lynda W.
Maria, such great material in here. It’s awesome. ~ David V.
:)) <3 ~ Steven P.
LOVE LOVE LOVE Maria ~ Jim B. Thank you Maria. As always, so very good and uplifting. ~ Carla J. So glad you send these every week! I always look forward to receiving them. ~ Steve F.
I wish you knew how much I look forward to these Friday emails. Thank you so much for including me. ~ Maria K.
I LOVE IT!!! ~ Fernando M.
It is a breath of fresh air to see someone working consciously to curate and create opportunities to uplift and inspire others, we need more of that in this world. ~ Kathryn D.
Really enjoy these positive Friday posts. Sorely needed these days. ~ Craig S.
Love your work, Maria. ~ Anthony H.
Thoroughly enjoying the new insights that come with each of your Friday emails. ~ Ian R.
Another great read on a Friday, Maria, thank you. Thanks for this, Maria! Keep 'em coming! Just reading about these ideas and journeys makes me less stressed. So THANK YOU!! :-) ~ Meredith F.
Here is this week’s 8 Good Things. This newsletter is my year-long weekly gift containing everything from articles to books to quotes to videos that are meant to be helpful, inspirational, aspirational, informational, and just fun to read! Please make sure to scroll all the way down to see our Upcoming Sojourn Events! New Trips! Photographic Safari and Mindfulness Workshops in Kenya and Botswana, Africa. Also: Walking the Camino de Santiago, Spain and Sailing and Hiking the Greek Islands. Ongoing Program (Beta) Happiness: The Art of Life Balance. Sojourn Explorers: Trek. Fundraise. Inspire. 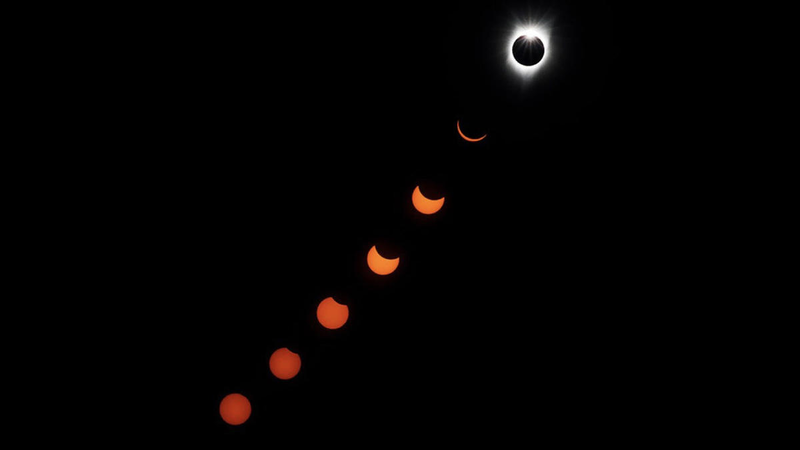 1) The Total Solar Eclipse Is Finally Here And The Photos Don’t Disappoint. Love the photos of folks at the White House wearing their eclipse glasses. I was at a planetarium in Los Angeles watching the live feed from NASA, that was super fun! 2) This Man Retired at 50 to Travel the World and See Eclipses. “Eclipse chasing is travel with a purpose.” Former ‘computer wonk’ Bill Kramer found something he really loved doing and made it his life. 3) Did you know Australia claims to have 10,000 beaches? Or, that Niagara Falls 'hurls' enough water over Canada’s Horseshoe Falls to fill a million bathtubs in about sixty-seconds? That the Statue of Liberty was a gift from France and was shipped by boat in 350 separate pieces? 13 Things You Didn’t Know About the World’s Greatest Tourist Attractions. 8) Why Doing Scary Things is a Sign You’re On the Right Path. Or, how to turn fear into a virtue. Former professional extreme athlete turned fear specialist Kristen Ulmer has some definite opinions about this very subject. Instead of using fear to cripple you, use it to grow. Great Plains Conservation’s Wild Studio was started by award-winning National Geographic filmmakers Beverly and Dereck Joubert. Whether you are a pro or an amateur, you will have the extraordinary experience of photographing lions, leopards, elephants, and buffalo. Best part is that there will always be a veteran wildlife photographer there to give you tips on getting great shots. Leave with an amazing portfolio of your wildlife adventure. Africa has long been my favorite place in the world, and I look forward to sharing it with you. Please join the Wild Studio Team and me on a uniquely curated safari that will tap into your true inner-photographer. I am committed to helping those who sit in the overwhelm, constantly feeling out of time, and always stressed. As a longtime TV producer, I have been there many times over. And have spent the last eleven years studying what to do about it. My promise is to get you out of the crazy and into the happy. To do that, I have put together a 90-day program. It is designed to be an ongoing curriculum that can fit into anyone’s schedule and can be joined online anytime. You will learn to manage your day-to-day world in a way that is sustainable. For a complimentary consultation, please contact me. I am leading a Prayer of the Heart Silent Meditation Walk and Picnic 9:30 am – 12:30 pm at Will Rogers State Park. Hiking level: easy to moderate. Length: 2-mile loop. We will meet in the parking lot, next to the polo field. This pilgrimage has long been on my travel ‘hit’ list. For years, I have heard inspiring stories about it. We will stay in quaint farm houses, 17th-century stone-made mansions. Eat well, drink well. Pray, meditate, breathe. Of course, walk. Go home happy. *the trip cost includes my Happiness: The Art of Life Balance program. If you romanticize sailing and hiking the islands in the Aegean, then come along with me. Explore, meditate, do restorative yoga, energizing breathwork, eat great food, dance. Find your inner Zorba. Opa! *the trip cost includes my Happiness: The Art of Life Balance program.